Sorry, the Strawberries are done for the season. It was a great season! I hope you got some. Traditionally Strawberry Season started with the first day of Summer, June 21st and lasted through July 4th or even mid July. In the last few years the season has moved earlier so that we have often started picking by June 12th or so, but it also means that we rarely have any berries left on the 4th of July . In 2014 we added a high tunnel for Strawberries, and that pushes the season even earlier. 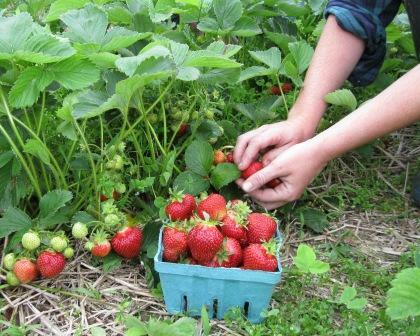 We have kept the outdoor strawberries, so we expect to have berries all of the month of June. This year we started picking June 8th (from the high tunnel) and expect to pick into early July (since the season is running a little late like an old-fashioned season.). 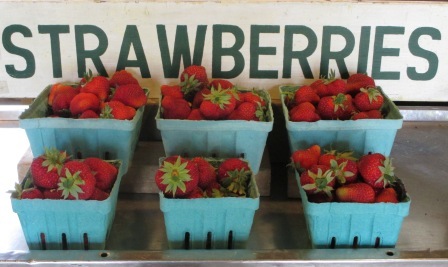 We have picked Strawberries at the farmstand. Sometimes just pints and sometimes both pints and quarts. 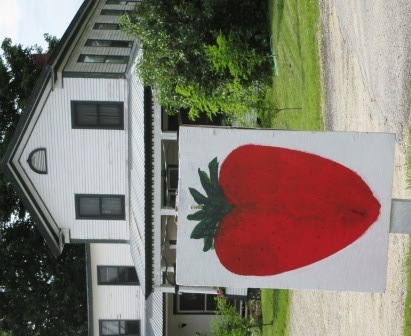 Watch for the Strawberry sign. It means we have picked Strawberries ready to go. Our phone message will tell you if we are open for picking. We will send out an email telling you when PYO starts. Email us and we'll put you on our list.